The U.S.A.F. Thunderbirds performed at the last Toledo Air Show in 2016. 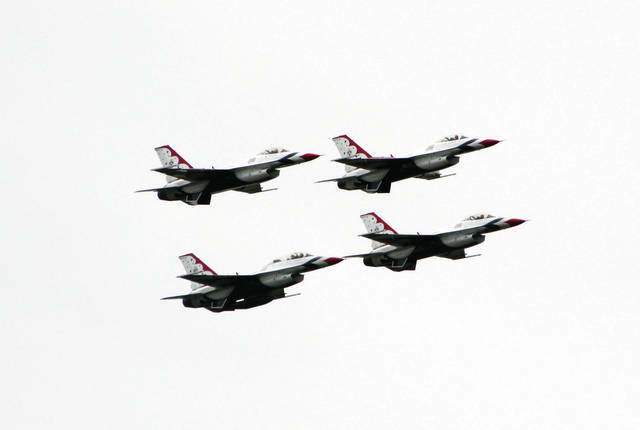 The Toledo Air Show is returning for another action-packed event on July 13-14, 2019, it was announced Thursday by the 180th Fighter Wing, Toledo-Lucas County Port Authority and the Toledo Regional Chamber of Commerce. The show will be hosted at Toledo Express Airport in Swanton Township and feature renowned military and civilian aerobatic performances, aircraft on display and other performances and activities. Performers will include nationally renowned acts including Tora Tora Tora, Class of ‘45 warbirds, Mig 17, Jackie B, Rob Holland and Shockwave Jet Truck among many others. There will be plenty of military jet action including the area’s own 180th Fighter Wing and other military demo teams to be announced in coming months. Static displays will include modern military aircraft, classic warbirds and general aviation aircraft for all to enjoy and spectators will also find a kids zone, simulators, interactive exhibits, helicopter rides, and food. Tickets will go on sale this month, on Black Friday, the day after Thanksgiving. Children 15 and under will be admitted free. There are also premium seating options available, including box seating and a Flightline Club that offers a VIP experience.